The three highlight antiquities we’ve seen this trip are the Valley of the Temples in Agrigento (Greece 2400 BCE); the remarkable Roman mosaics (300 CE) at the Villa Romana del Casale in Piazza Armerina, and the rarely open Houses of Augustus and Livia with their delicate wall frescoes in the Roman Forum (50 BCE). 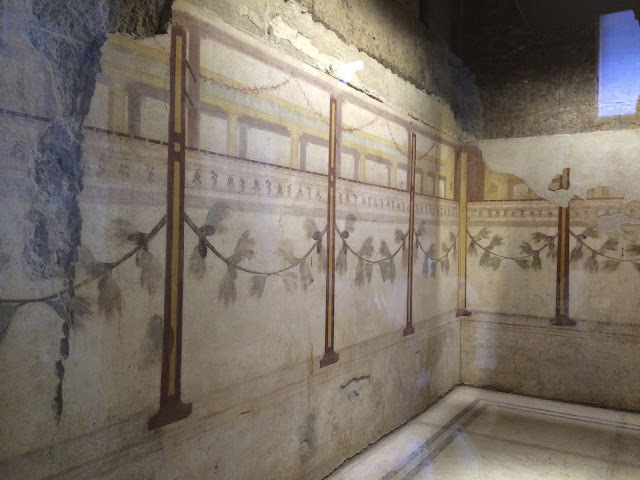 Rome: In keeping with low-level Italian disorganization (charming but enough already…), it’s nearly impossible to figure out when or if the Houses of Augustus and Livia on the top of the Palatine Hill in the Roman Forum are open to the public. By “public” they mean private group tours of no more than 8 people. By “group tours” they mean in a specific language that you can understand. Hence, there are only one or two times per week that one can join an English guided tour. Despite zero information on the website, I manage to find the right ticket window at the Forum and snag two spots on the only weekend tour. The meet-up place is vague: The Arch of Titus wearing the teeny white identifying sticker. We wait and wait, circling the arch, occasionally peering in at the frieze of the captured Temple treasures being paraded in victory, and mostly avoiding the picture takers. Finally a young woman with wild hair (our guide) rushes over and 3 of us (very private tour – yay) head up the hill. It’s a kick to have someone take out a big ring of keys and slip past the crowds to disappear into an off limits site. 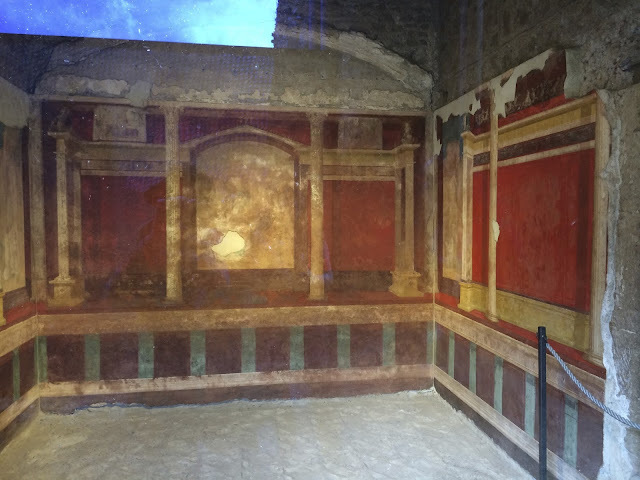 Augustus, first Roman Emperor, built a modest home next to the original venerated and simple site of the early Romans, descendants of Romulus and the she-wolf, in order to emphasize his connection as heir to the founding myth. 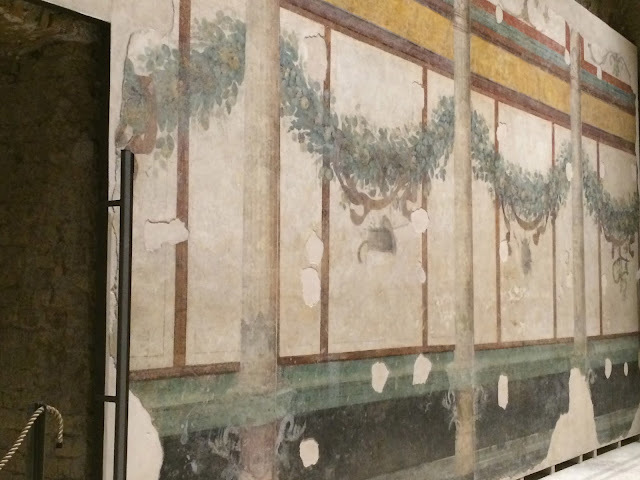 The site has been known forever, but the frescoes within recently underwent extensive, multi-year restoration. The delicacy, details and colors are breath-taking. 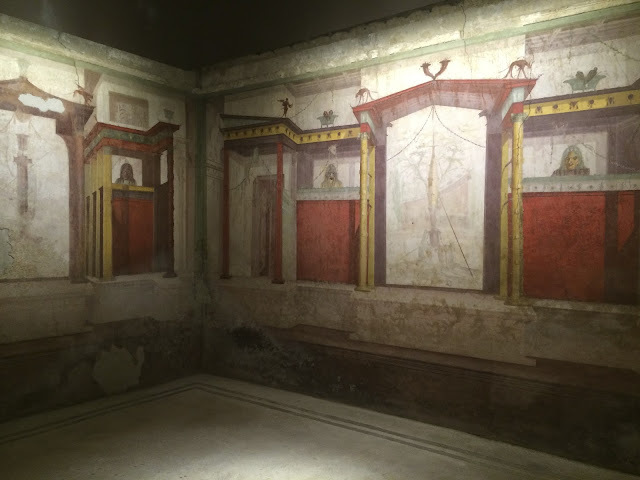 The companion house of Livia, Augustus’ wife, is more recently excavated and its frescoes are extensive and in excellent shape. Because of their delicate nature and susceptibility to moisture, the houses are open very selectively. It was a rare privilege to tiptoe among these treasures, away from the maddening crowds. Because they close for months at a time for restoration or in fear of deterioration, it’s hard to know in advance whether you can visit. The two ticket entrances to the Forum should be able to provide answers – insist if they give you a hard time. 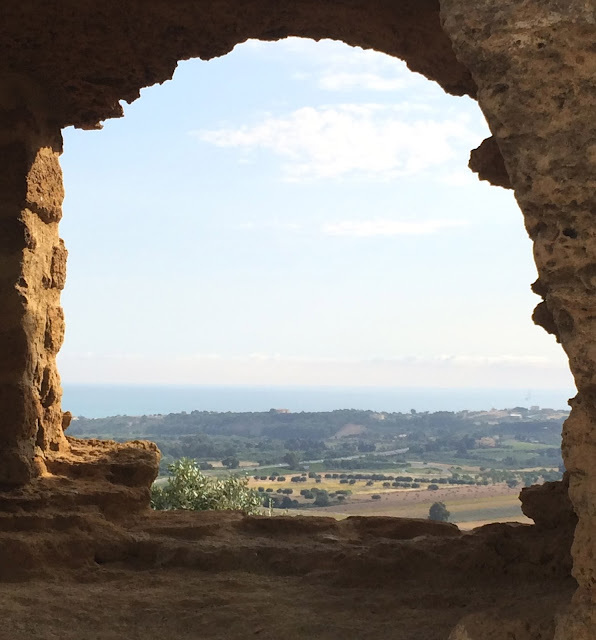 Later Rome: The site of Villa Romana del Casale at Piazza Armerina is almost dead center in Sicily and hence far from anywhere, but oh-so worth it. Dating from early 300s CE, the home of the brother of Emperor Diocletian, it was in use through the late Middle Ages and then buried in silt from a flood for the next 800 years. 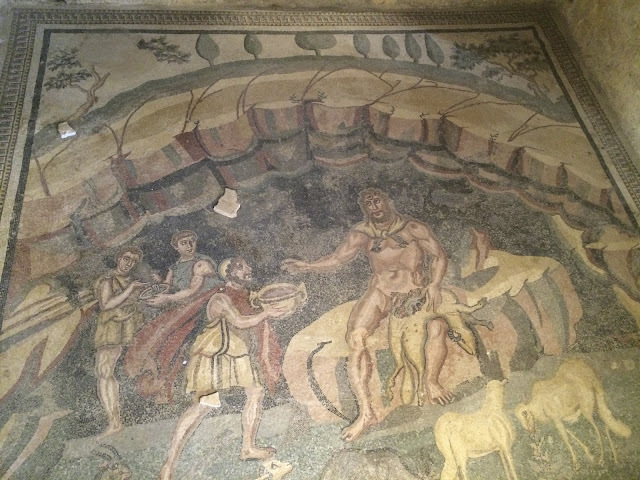 Discovered in the late 19thcentury, excavations didn’t get going until 1950 and are on-going. 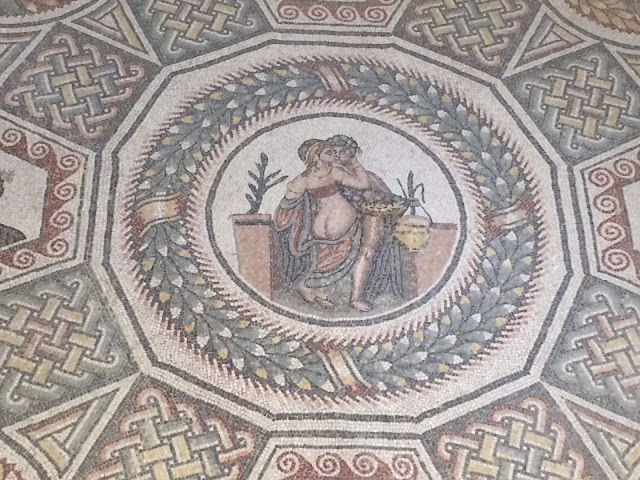 The mosaic floors are simply unbelievable. So much so that D and I first thought that this had to be a scam; we’d never heard of it, or any reference to it, and the mosaics are wondrous. But of course it’s real and always thrilling to encounter something that you just didn’t expect. 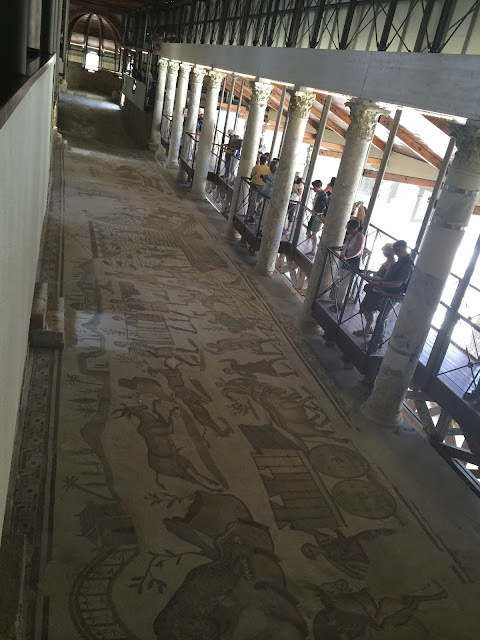 Because the floors of the various rooms are in such excellent condition, it’s also a terrific recreation of a working Roman villa. The centerpiece is a 200 ft long banquet hall floor with intricate depictions of capturing wild animals in Africa and loading them on to ships for transport to Rome for their appearance in Coliseum events. 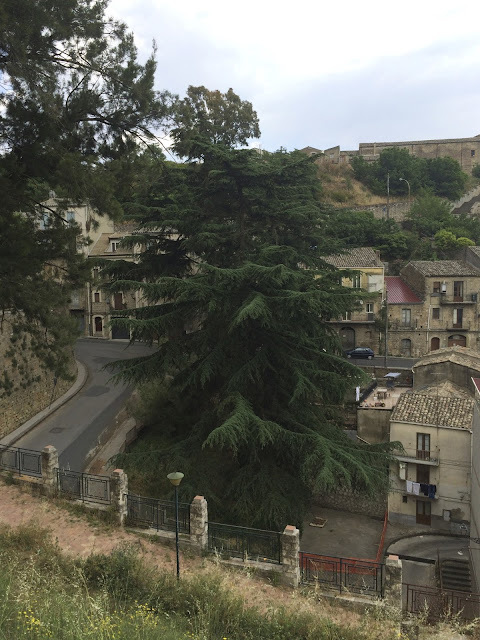 The surrounding area is quiet and atmospheric – hills, olive groves, the pretty hill town of Piazza Armerina close by for wandering and lunch. The first huge cedars I’ve seen – very reminiscent of Lebanon. 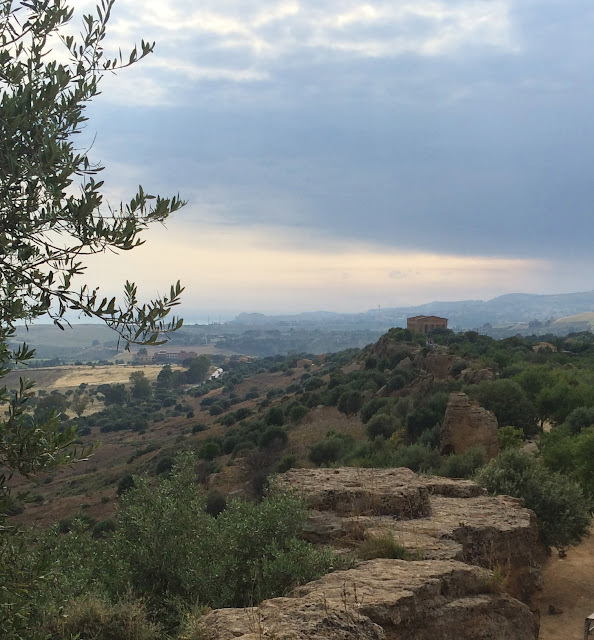 Agrigento lies on the southern coast of Sicily. The Valley of the Temples – the seven remaining temples of the Greek city of Akragas – is the highlight antiquity of Sicily. 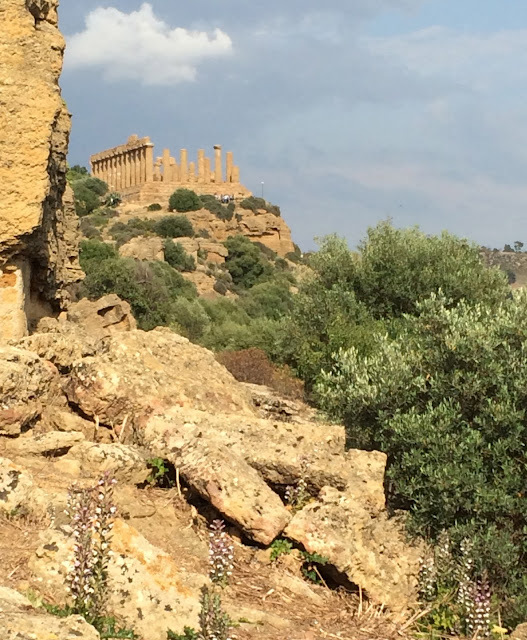 The temples sit on a hill looking out over the blue, blue sea – unfortunately encroached upon by the sprawling (and really ugly) modern city of Agrigento on the hills above. But looking out from atop the remaining walls down to the Mediterranean, across the acanthus and cactus and the ochre rocks, it’s possible to imagine that this is what the Greeks saw 2,400 years ago. The East entrance starts at the highest point and contains the three most intact temples and the West entrance starts at the lowest point with the least intact but more sprawling ruins. Each side has its own atmosphere but I particularly enjoyed the less intact western site with the ruined temple to Zeus – once one of the largest temples in the Greek world. 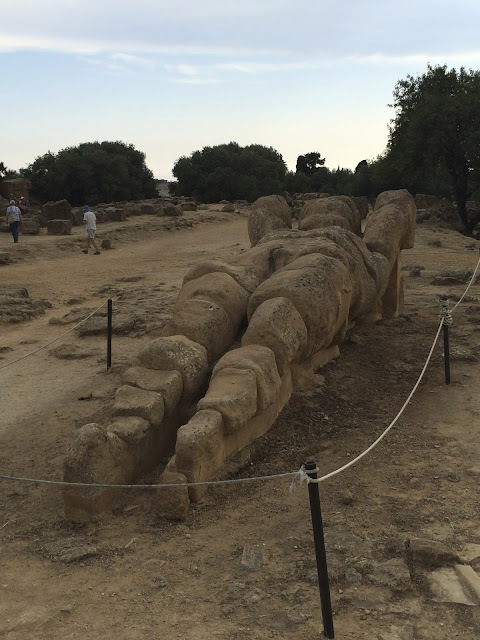 The “Telamon” below was reconstructed on site, fallen. Originally these Samsonesque statues (huge) held up the roof of the massive temple. 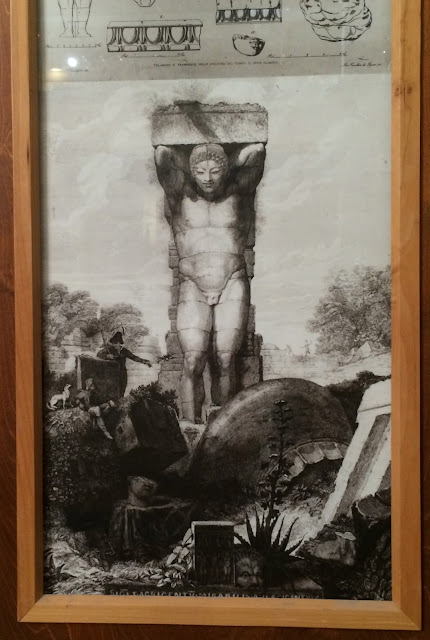 An upright version is displayed in the museum along with several sketches of what these Herculean figures might have looked like. 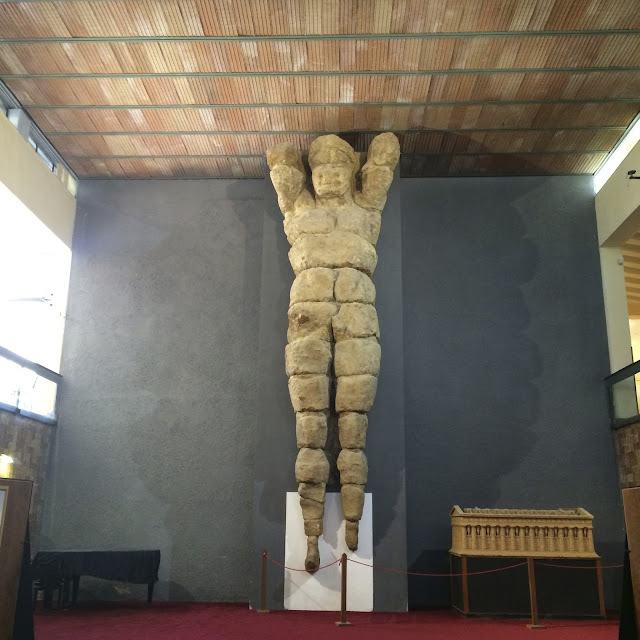 The regional archeological museum where all the actual treasures reside, is a must – delightful, informative, well marked in English with dioramas of the original city and history of excavations. The site itself was (occasionally) overrun by tour groups – but they move out quickly as they are chop-chop on to the next site, but the museum was empty. 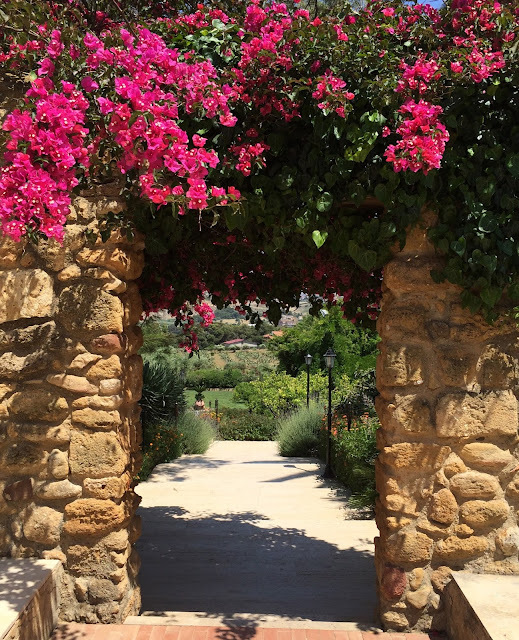 Do not go to Agrigento without checking out the museum and its beautiful location on the grounds of the medieval Saint Nicholas convent. 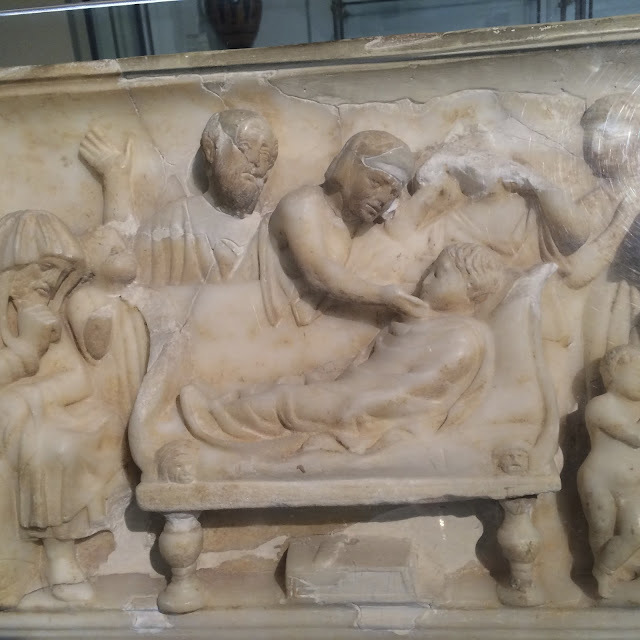 Below is a detail from a child’s sarcophagus (Roman, 200 CE) carved in marble and painfully evocative. The mother caresses the child’s cheek; the father raises his hand in despair and the elders sit in mourning, chin in hands. 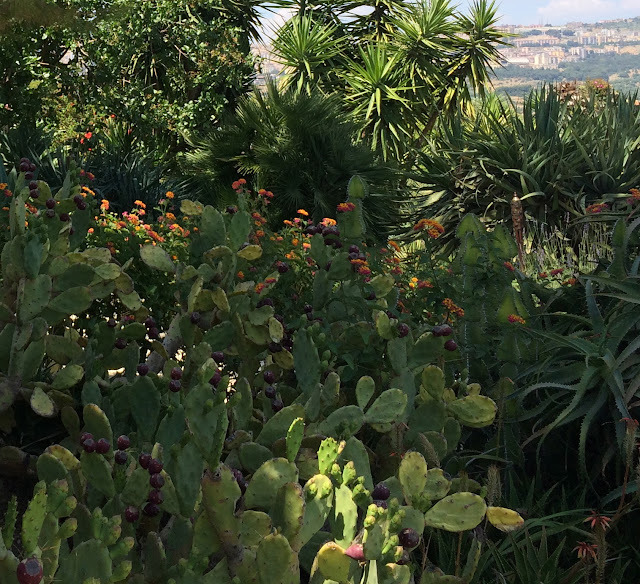 Our hotel, Baglio della Luna, was a mile away with a gorgeous garden filled with olive, lemon and almond trees, prickly pear cactus and hot magenta bougainvillea. From our room we had a night view of the lighted temples with the full moon rising over the sea. Spectacular! Ciao bella!